The financial benefits of going solar are now well documented. Solar panel systems actually function as investments with strong rates of return, and homeowners generating solar electricity can avoid paying increased utility rates by eliminating their electricity bills. According to a 2015 report by the Lawrence Berkeley National Laboratory, installing solar panels on your home can even increase your property values. If you’re reviewing multiple quotes, there are plenty of metrics that can help you make a decision about which solar option is best for you, but studies show most solar shoppers rely on one metric in particular: the solar panel payback period. 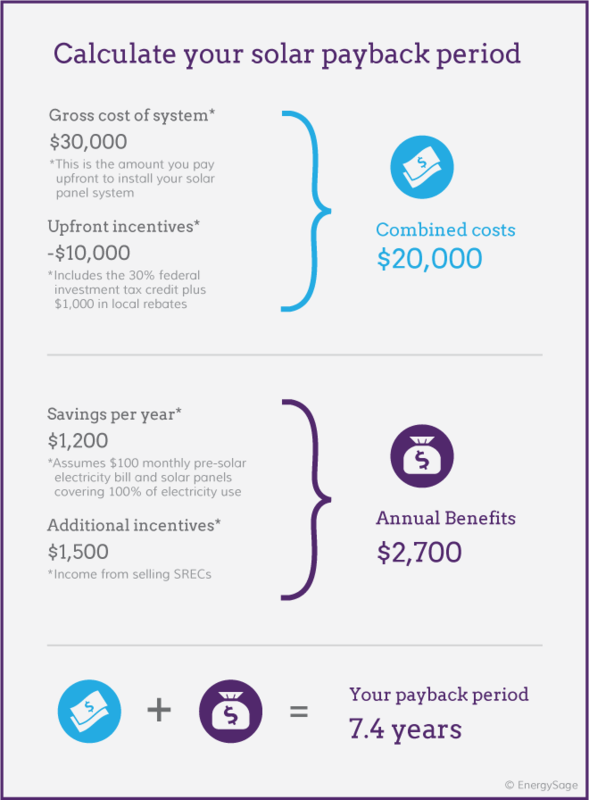 What is solar panel payback period? 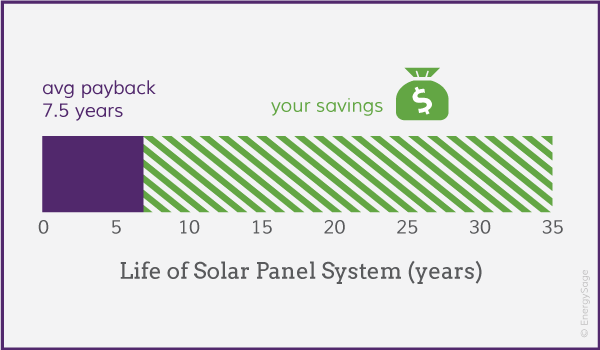 How is the solar panel payback period calculated? Gross cost of solar panel system: The net cost of installing solar on your home is dependent on the size of the system you select and the equipment that makes up that system. Value of up-front financial incentives: Tax breaks and rebates can dramatically reduce the cost of going solar. The federal investment tax credit allows you to deduct 30% of the cost of your system from your taxes, and additional state and local financial incentives may also be available in your area. Average monthly electricity use: The amount of electricity that you consume monthly is an indicator of both the size of system you need and the amount of electricity that you can offset each month with solar. The higher your electricity bills are, the shorter your estimated payback period will be, as you can reduce or eliminate this bill as soon as your panels are operational. 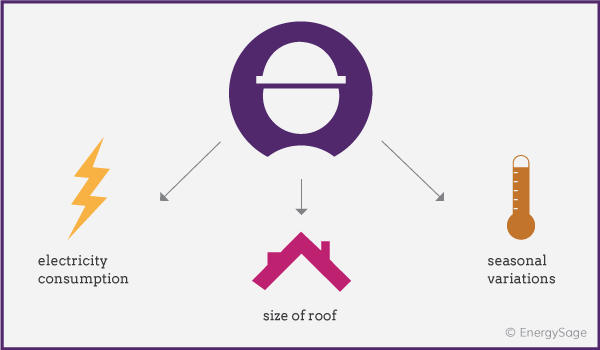 Estimated electricity generation: While solar installers will try to provide you with a system that matches your electricity consumption, practical constraints like the size of your roof and seasonal weather variation may impact the amount of electricity that you can produce on-site. Additional financial incentives: In some areas of the country, you may be able to earn additional incentives in the form of solar renewable energy certificates(SRECs) or other utility programs that give you a per kilowatt-hour credit for the electricity that your solar panels generate. Depending on the size of your solar energy system, these can represent a significant monetary benefit. Subtract the value of up-front incentives and rebates from the gross cost of your solar panel system. Sum up your annual financial benefits, including avoided electricity costs and any additional incentives. Divide your combined costs by your annual financial benefits. The result will be the number of years it will take for you to achieve payback. Every month of savings after that point in time should be counted as a financial gain!. Comparing quotes from multiple solar installers can actually help you go solar with a shorter payback period than the national average. Data from the EnergySage Solar Marketplace shows that, in 2019, solar shoppers who compare their options in the Marketplace can achieve payback on their solar investment in about 7.5 years – faster than the national average! Those solar shoppers will continue to enjoy free electricity for the life of their solar panel systems, which can last between 25 and 35 years.